My grandmaw that is, perhaps yours too. Read on and make that call for yourself. First off like most people I had two wonderful grandmothers. One was Italian on my mothers side. She was amazing in the kitchen and raised me more as my mother than my grandmother in my early years. Anything that woman touched in the kitchen was pure gold. Sadly she left us way to young, the consequences of her one true vice, smoking. My fathers mother is where this recipe came from. She was equally a second mother to me and taught me a lot about what to do and what not to do in the kitchen. Sadly both by example. She was old country Ukrainian as in actually came over in the early 1900s old enough to remember “the old country”. The woman could bake anything as though an angle cooked it and the ethinic food don’t let me get started on it, wow I miss it. Meat though? As in steak, roast beef, pork chops, etc. The woman murdered meat. Everything was cooked to oblivion, there was a saying at Sunday dinner, “Thank God for Gravy”. This was a deep seated and irreversible consequence of her living at a time with no refrigeration. Meat was to be cooked to death to make sure death wasn’t the result of consuming it. Her saving grace with meats? Anything deep fried. 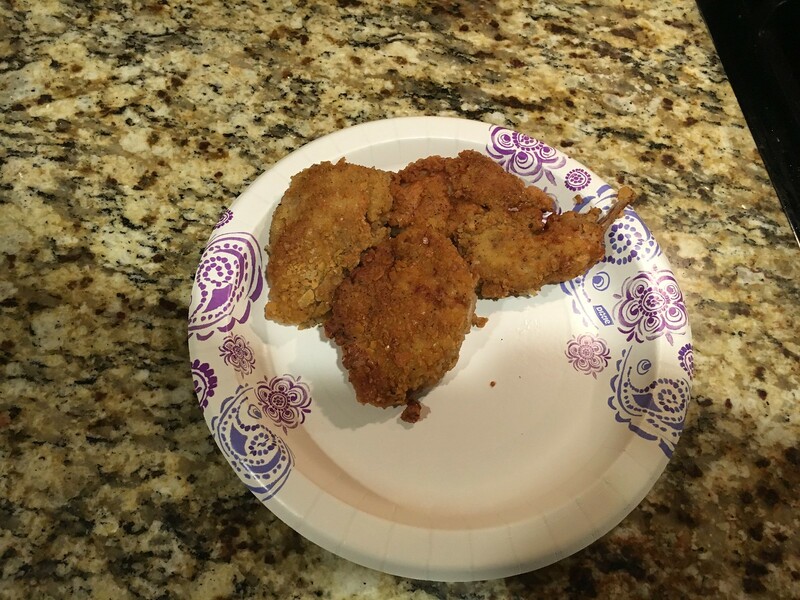 How a Ukrainian Grandmother in Pennsylvania came to this following recipie for frying chicken which is about a southern as it gets, she never told me. 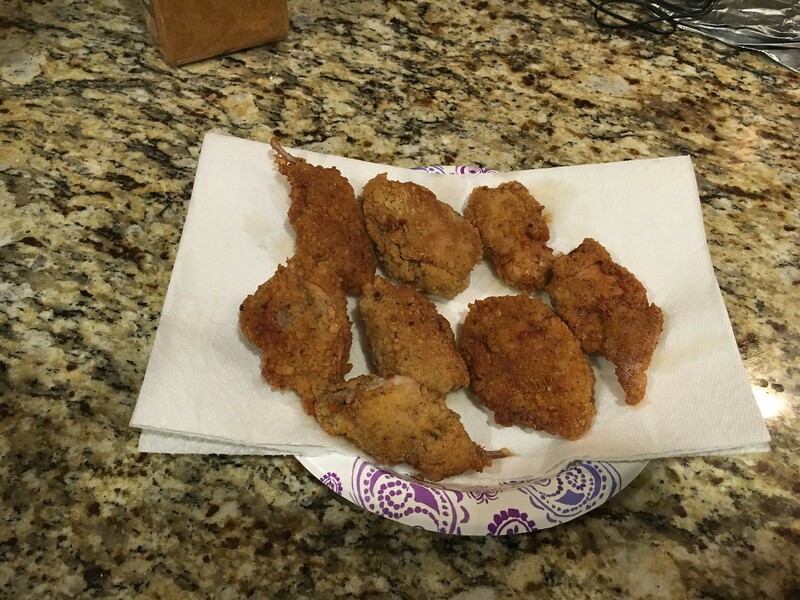 But last night I was thinking of her and since I just culled some of our male Texas A&M quail I decided to dust off the memory of her chicken and try it will quail. The only additions I added were I used some Keith Snow Grilled Chicken Seasoning in the Flour and I didn’t use butter milk. That makes it better, but this was spur of the moment decision and we didn’t have any. Since it was quail, I also used quail eggs vs. chicken eggs. Here is what you do, Part the quail out into quarters. Split the breasts in half and take the leg and thy as individual pieces. Make a two station coating set up. 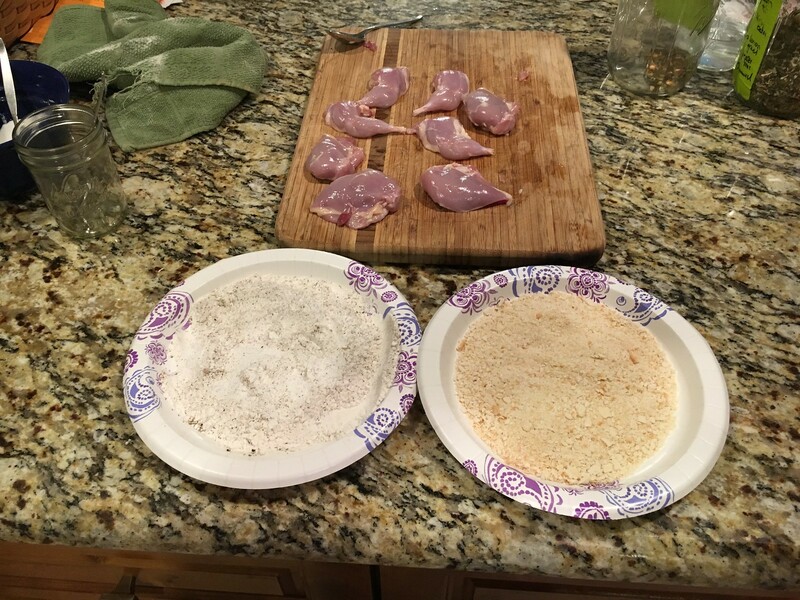 One plate with flour, salt, pepper and any seasoning you want. This is where I added some Keith Snow grilled chicken seasoning. In the other use cracker crumbs. Saltines, you can buy them or do what I did, put some crackers in a ziplock bag and roll them with a mason jar. Just like grandmaw did. Next in a bowl beat one egg with about an equal amount of butter milk. I used 5 quails eggs about the same as one chicken egg. 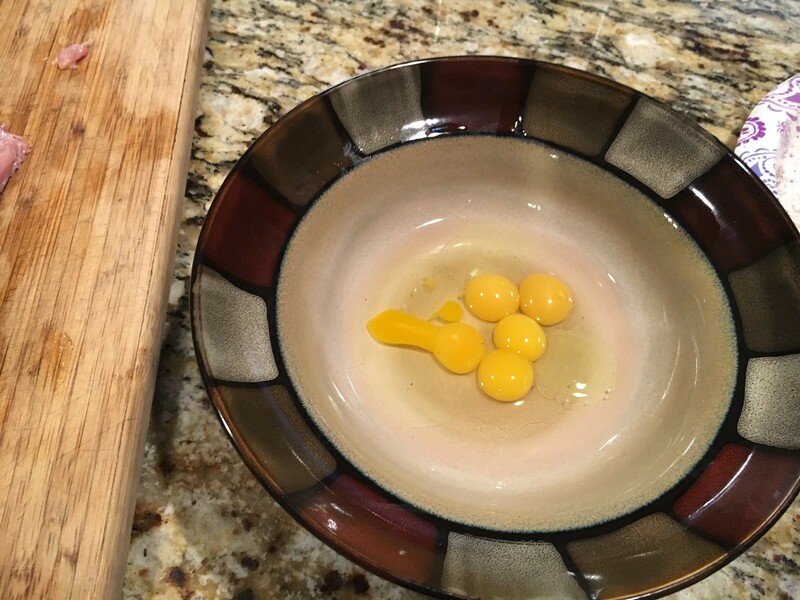 Well four actually one was double yolk, poor little quail who laid that thing! Next dip your pieces into the egg mix, then roll in flour. Now dip in egg again, and roll in cracker crumbs. Here is another deviation, my grandmother would do all this in the morning, then put the pieces in the fridge till dinner. This makes the breading really stick beautifully! You can even do this and put them on a try in the freezer. Once solid vacuum seal and you have take out and fry ready to go chicken, done this way the breading really holds up beautifully. Since it was 6PM and I was hungry I went strait to the frying pan. Now pay attention this is important. No non stick teflon coated crap, no canola oil, none of that new fangeled crap as granny called it. 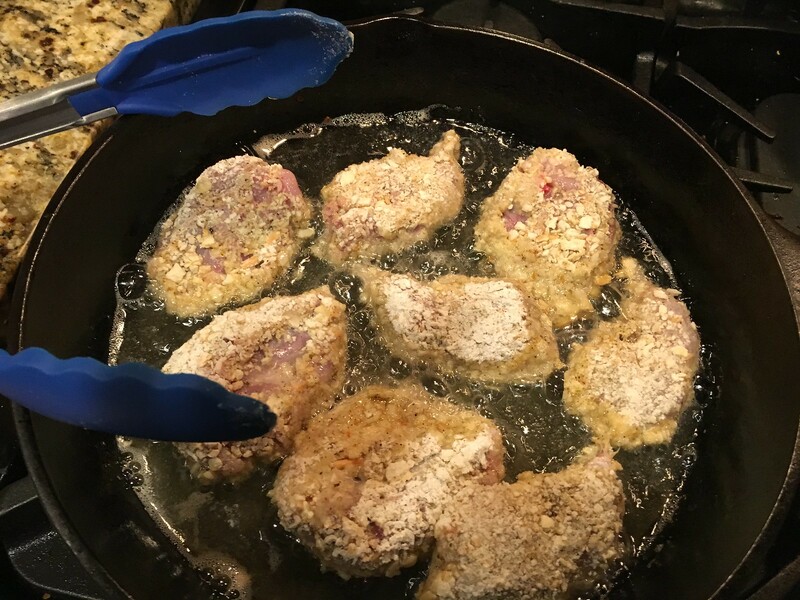 You melt enough lard into a well seasoned cast iron skillet so that the lard will come up about half way on the sized pieces you are frying. Get the oil to a medium heat. Put your pieces in, for your breasts go meat side down first, ALWAYS or you get your hand smacked. I can still hear her over my shoulder saying, always the thick side first. Fry to golden brown, turn and do the same. Now if you are doing big pieces you may need to put them in a pan with a rack at the bottom to keep them from sitting in grease and put in the oven at 350 for about 15 minutes to finish them though. For quail though they are small and done right away. Take the pieces and set them on paper towel to drain. Grandmaw used old news paper rather than waste a “good paper towel” but we don’t really use news paper and sorry grandmaw not hip on news print chemicals. But the 1980s were a different time were they not? Now quail are some small little birds but as you can see done this way they make a decent meal at just one bird per person as part of a full meal. Add some vegetables, some sweet potato fries and a salad and this would be bangin. That said it was late and we had been at the movies, Dorothy didn’t want any so I didn’t bother with sides and just ate all of it. Final thoughts on what I would suggest differently. The coating did stick really well, hot grease helps with this a lot but not too hot least it brown to fast but a day in the fridge is a good idea it will stick even better. Though the coating held up well it crumpled a lot when eating the breast pieces, you have to contort those little things a lot to get the meat off the bone. I would take a few moments to bone the breast pieces next time. The leg quarters, work just fine though. This was really good but saltine crackers are not that flavorful. I did it this way as a tribute to grandmaw, if you are going to do crackers, butter crackers or ritz style have more flavor. While it is true this was NOT paleo it was not that bad as a once in a while treat and hey, grandmaw deserves to be paid tribute to at times. In the end it was not a lot of carbs really but yea higher than something I would eat often. Honestly this will taste better and be about 2 carbs per piece of quail. If you just get creative I bet you can figure out exactly what to do but my official recipe will come soon. If you really want to make this a forget healthy eating for a day and just have a glorious treat, mix a butter and flour roux with some of the lard, add salt and course cracked pepper and make white gravy! When you work hard all the time you can treat yourself to such things from time to time and not feel bad about it. Please show us, in video, how to butcher a Quail!